Investors are fleeing the watchmaker's stock as it grapples with a huge shift in demand. 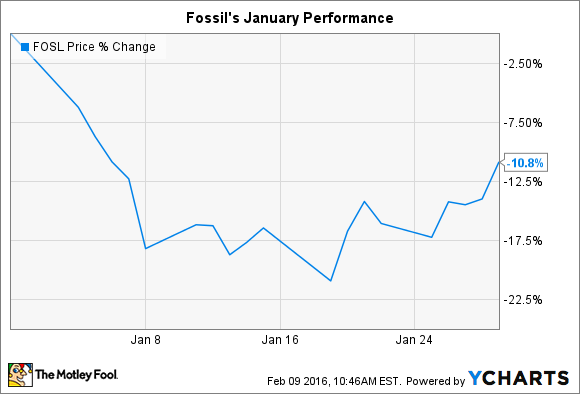 What: Fossil (NASDAQ:FOSL) stock fell 11% in January, according to data provided by S&P Global Market Intelligence. The slump came after a brutal 2015 for shareholders, who saw their investment sink 67% last year. So what: A key factor behind January's decline was simply the fact that stocks fell overall. The broader market dropped by 5% last month -- but that still left Fossil shares underperforming by six percentage points. Investors are stepping away from shares after Fossil's third-quarter earnings results showed evidence of a fundamental, and negative, shift in its watch market. The company posted a double-digit sales decline in that category last quarter. "We are not satisfied with our overall performance," CEO Kostas Kartsotis said in a press release. Management believes consumers are moving away from traditional timepieces and toward wearable technology. Fossil doesn't enjoy the same market power or brand strength in that arena, which is one reason why it opted to acquire wearables maker Misfit in November. Now what: The company is due to post results for the holiday quarter on Feb. 16, and Wall Street is expecting more bad news in that report. Consensus estimates show sales falling a further 13%, to $927 million, as earnings plunge by 55%, to $1.32 per share. The recent dive in shares reflects the fact that there's so much uncertainty around Fossil's core market right now. On the other hand, the stock could start growing again if investors see evidence that watch sales have at least started to stabilize. In the meantime, Kartsotis and his executive team hope to build up a solid market presence in the highly competitive wearable-tech sector.